Standard Turtle Shells® have been designed and engineered to work in most common environments to protect standard equipment cabinets and account for surrounding services, support framing, cable racks and fiber troughs. However, Turtle Shells® can be customized to almost any situation. Shells are typically mounted 12”-15” above the cabinet measured from the lowest point of the shell to the top of the cabinet. 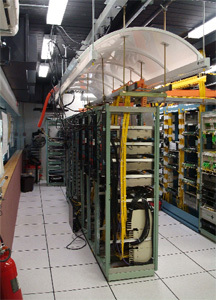 Actual height will depend on existing conditions including services, support framing, cable racks and fiber troughs. Standard Turtle Shells® are supported from above or below using threaded rods mounted to framing support. We have also designed custom shells that can be mounted to walls or supported using other methods.